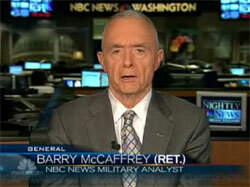 Retired four-star general Barry R. McCaffrey, appearing as an analyst for NBC Nightly News. Media outlets must develop their own, independent, military analysts, ones not beholden to the military-industrial complex, ones whose very sense of self is not defined, nourished, and sustained by the U.S. military. In separate exposés in The New York Times (April 20 and November 30), David Barstow showed how major media outlets came to rely on retired generals like Barry McCaffrey for analysis. Predictably, many of these men (they were all men) continued as paid advisors to defense contractors even as they appeared on TV. They also often accepted favors from the Pentagon, to include special, often classified, briefings; overseas junkets; and, most valuable of all, access to the Office of the Secretary of Defense. But such influence-peddling and collusion are hardly surprising. Relying on high-ranking, retired military officers to serve as frank and disinterested critics is a bit like inviting Paul von Hindenburg, ex-Field Marshal of the German Army, to testify in 1919 on why his army lost World War I. You’ll get some interesting testimony -- just don’t expect it to be critical or for that matter even true. So why did the networks hire so many retired colonels and generals? Perhaps they followed a rationale analogous to that used in hiring retired professional athletes to cover sports -- to provide hard-earned, technical commentary, leavened with occasional anecdotes. But in the "forever war" in which we became engaged, these retired military officers soon provided not just the color commentary but the play-by-play. And network anchors, lacking first-hand military experience, were reduced to bobble-heads, nodding in respectful agreement. But war is not a sport. Nor should we cover it as such. We need tough-minded military analysts, not "Team America" boosters and Pentagon spin-meisters. Despite their civilian coat-and-tie camouflage, these officers are not ex-generals and ex-colonels: they are retired generals and colonels. They still carry their rank; they still wear the uniform at military functions; they’re still deferentially called "sir" by the rank-and-file. They enjoy constant reminders of their privileged military status. It’s not that these men over-identify with the U.S. military -- they are the military. The senior colonels and generals I’ve known despise Monday-morning quarterbacks. Loath to criticize commanders in the field, they tend to defer to the commander-in-chief. Putting on mufti doesn’t change this mindset. Rather than airing their most critical thoughts, they tend to keep them private, especially in cases where service loyalty is perceived to be involved. Military officers are especially averse to airing criticism if they perceive it might undermine troop morale in the field. Related to this is the belief that "negative" media criticism led to America’s defeat in Vietnam, the hoary but nevertheless powerful "stab-in-the-back" myth. Thus, these men see Pentagon boosterism as a service to the nation -- one that they believe is desperately needed to redress the balance of negatively-charged, "liberal," anti-war coverage. Paradoxically, that the "War on Terror" has gone badly is a reason why some retired military officers believe we can’tafford serious criticism. If you believe the war can and must be won, as most of them do, you may suppress your own doubts, fearing that, if you air them, you’ll be responsible for tipping the balance in favor of the enemy. The fifth, perhaps most telling, reason why networks should not rely on retired colonels and generals is that it’s extremely difficult for anyone, let alone a die-hard military man, to criticize our military because such criticism is taken so personally by so many Americans. When you criticize the military, even abstractly, people hear you attacking Johnny or Suzy -- their son or daughter, or the boy or girl next door, who selflessly enlisted to defend America. Who wants to hear that Johnny or Suzy may possibly be fighting (even dying) for a mistake? And, assuming he believed it, what senior military man wants to appear on TV to pass along that message to America’s mothers and fathers? It's not that retired colonels and generals lack integrity, but they are often deeply conflicted and lacking in self-awareness. And you certainly can’t profess to be an objective media analyst while representing contractors vying for funding from the Pentagon. So what should the media do? Since it will take time for networks to develop their own corps of independent military analysts, they should consider hiring junior officers and NCOs, with recent combat experience, who have left the military after a few years of honorable service. Civilian military historians could also provide critical commentary. Even foreign military officers might be queried; at least they need not worry about their patriotism being impugned each time they hazard a criticism of the Pentagon. French premier Georges Clemenceau famously noted that "War is too important to be left to generals." So too is the TV and cable networks’ analysis of our wars. Mr. Astore brings up an issue which has bothered/ puzzled/ perplexed/ disturbed me for many years. Those years began after my time in Viet-Nam almost exactly 40 years ago. As both an undergraduate and graduate student I discovered that I was almost always looking on in askance at how the press handled and covered the military. My initial worries tended to be on the "divorce" between the US military and the rest of civilian society. That is still a major concern of mine, in fact. However, what I often read or saw as coverage of the military in the press/ media was cause for concern simply because it seemed to miss what were obvious points or issues.  It seemed only a handful of those in the press had the ability to look at the clues, find the dots, and then connect them. The emnity of the military towards the press was literally visceral after Viet-Nam and has not lessened significantly even in the present day. Which is, of course, the paradox of those senior officers appearing as talking heads on television. In general (sorry...), I tend to not pay much (if any) attention attention to the generals when they appear. Indeed, I must openly admit that I am not an evening news watcher, with the exception of the Lehrer program whenever I am home early enough to watch it. A major reason that I usually avoid watching the generals is that they are, as Mr. Astore observes, still generals and parroting the party line. Sorry, but I have spent enough time here in the Puzzle Palace to know bovine exhaust when I hear it. After 21 months in SWA, a tour as a Ranger in Viet-Nam, and not being born last night, I find much of what the generals spout as being nonsense. Mr. Astore gets it "right" on that score. What is a problem is that it will take time to develop this expertise Astore wishes the press to have. As an interim measure, there are actually colonels who don't fit that mold (another point to Astore) that is currently being used. They are not used, obviously, because they raise questions and issues that the folks in the Pentagon do not want discussed. A tip of the hat to Mr. Astore for bring this issue to the table. From NiemanWatchdog.org in April: The New York Times ran a story on a highly questionable Pentagon program in which retired military leaders tried to manipulate public opinion in favor of the Iraq war. A story like that should have legs. So what happened to it?